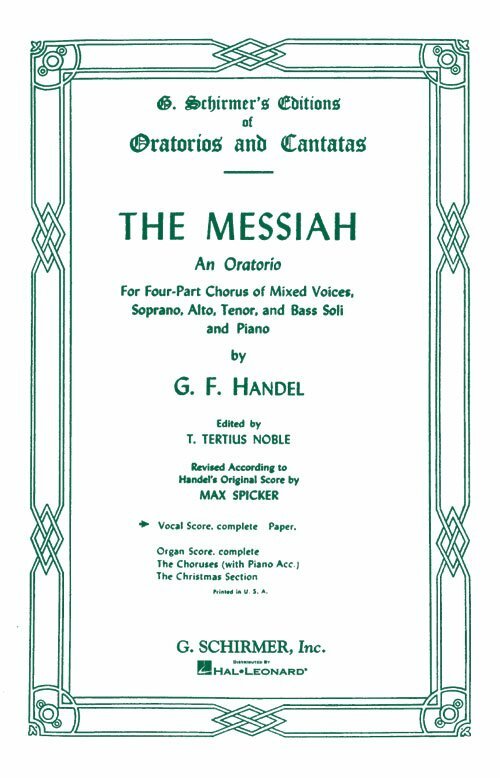 THE MESSIAH, Handel's most successful and best known oratorio, was composed in the year 1741 in twenty four days, from August the 22nd to September the 14th. It was first performed at a concert given for charitable purposes at Dublin, Ireland, on April the 13th, 1742, with Handel, himself conducting the performance. As the centuries have passed, a considerable number of vocal scores have, of course, been made after Flandel's partition; notably that by Dr. Clarke (Whitfield Clarke, 1809), and a later one by Vincent Novello. Their value, however, was more or less doubtful, their character being rather that of transcriptions in pianoforte style, with not infrequent arbitrary or capricious aberrations, than a faithful and exact reduction of the orchestral score. Neither have the more recent editions of vocal scores based on the Mozart orchestra score, with its many contrapuntal charms, quite fulfilled expectations, as they materially increased the difficulty of the piano part. Hence, a vocal score which should be in every way reliable and practical has become a matter of prime necessity. The present edition agrees at every point with Handel's original score, as it follows the facsimile edition of this latter with most careful exactitude. Slight deviations from the original, which in the course of many years have obtained almost traditional authority, are inserted in small notes in every case, the professional artist being left free to employ them or not, at his discretion.